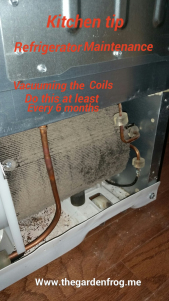 Do you know that you need to vacuum and keep the coils and motor on your refrigerator clean? If you have pets, this should be done at least every 6 months. Otherwise this should be done every 12 months according to the maintenance specs in your refrigerator manual. 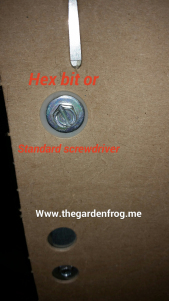 This is an important maintenance chore that can keep your refrigerator running (efficiently) and extend the life of your refrigerator. 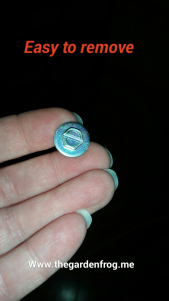 There is another thing you should know- a lack of maintenance can void your warranty. Home warranty companies expect you to perform this maintenance chore as well. I have personal experience with this when my 4 year old refrigerator needed repair and the home warranty company sent out a repairman. The repairman pulled off the back cover and looked at me saying “you clean your coils?” I replied “yes, I clean them every 6-8 months”. 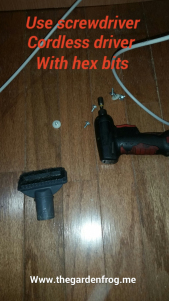 He and I talked and he told me not many people do this important maintance chore AND that if he would have found dust and hair covered coils he would have to report that to the company who most likely would have not paid for the repairs. 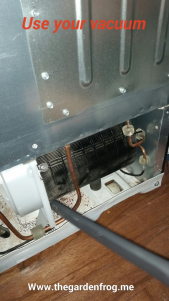 He told me I was “lucky” because the first thing a repairman usually checks is the condition of the coils and if they are full of dust and hair as well as how much airflow is around the refrigerator. 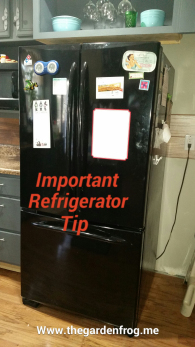 Newer refrigerators do not need more than a couple inches of space between the back of the refrigerator and the sides but older refrigerators may need at least 4″ for proper air flow. 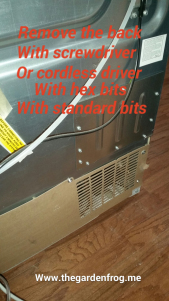 I also want to let you in on another hint the repairman gave me –always have your refrigerator on its own circuit with nothing else plugged in with it. He told me that many refrigerator manufacturer and/or the warranty companies will void the warranty if the appliance is not on its own circuit and/or plugged in to a surge protector. 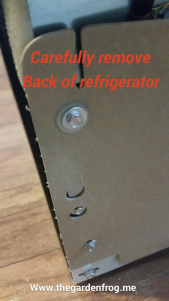 I was lucky again because when we remodeled our kitchen we put the refrigerator on its own circuit. 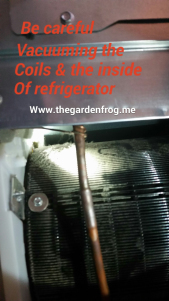 I have known about cleaning my refrigerator coils ever since I was a young adult and I have always made it a part of my deep cleaning in the spring and fall. This will not take you more than 30 minutes and is important. Check your refrigerator and appliance manuals for installation and maintenance chores too. Below there are a few pictures to guide you in this process. Thank you for stopping by and keep watching for more kitchen tips in the future.